Are you tired of using American names in your designs as placeholders? There is nothing wrong with that but there are people with names that are more than one syllable. Products are designed for a global audience so designers should start using names from other parts of the world. That focus of my sketches today is flow patterns and micro interactions. These are just a subset of the full pattern library. 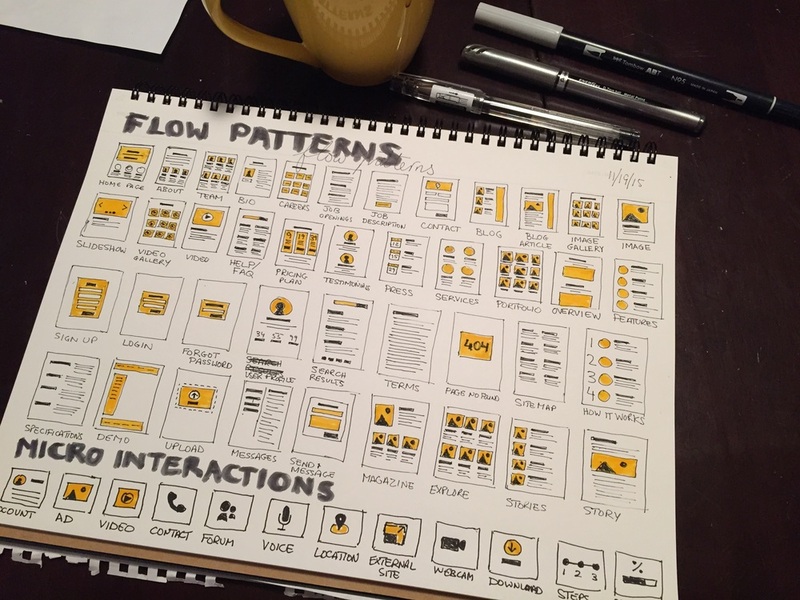 Sketching all these patterns helped me understand how to quickly sketch ui elements. Using color to highlight key areas of the pattern is something I have been wanting to try out. Even though my hand is really tired right now from sketching this was definitely a fun exercise for me since I learned a lot. How do I love thee Sketch? Let me count the ways. A tool is a tool is a tool. Sketch is a great tool. It has helped me speed up my design workflow tremendously. Here are some of the things I love about Sketch. Guides show up when an object is equal distance or has same width as other objects that are close by. Duplicating artboards with locked layers? Not to worry. They get duplicated too! I am sure there are many more but these are the ones that come to mind. Got Sketch tips you want to share? Hit me up on Twitter.